The houndstooth fabric (houndstooth check fabric) derives from Welsh Prince woolen fabric. Duke Windsor is the first celebrity who wears it. This kind of woolen fabric is popular with England aristocrat in 19-20 century. Then Christian Dior brings it to the fashion show. In 1948, Mr. Dior used houndstooth check on the packing boxes to perfume, and give it a beautiful name-- Houndstooth Check. The pointed check effect is produced by the 2 up - 2 down twill and yarns of contrasting colors in groups of four in both, the warp and the filling. The broken check pattern resembles the jagged back teeth of a hound. It is a broken or jagged check pattern of small or medium size. The woven design looks like a quadrangular star. It is usually made from wool with a broken twill weave. It has natural stretch than a jersey knit. This kind of houndstooth fabric is elastic with pilling resistance, wrinkle resistance. Besides, its environmental-friendly index has meets the European standard. It has a soft hand feeling. 1. It is broken check pattern. 2. The design looks like a quadrangular star. 3. It is natural stretch with soft and comfortable hand feeling. Applications: It is mainly used for women clothes of winter and fall. We are professional manufacturer and supplier of houndstooth fabric (houndstooth check fabric) in China. With 15years experience of production, selling, and service, we can design process and product products with meeting needs of customers as well as offer OEM service. Our factories produces 1million meters wool fabric, 10,000 tons chemical yarn, 40,000 tons tinplate, and 50,000 tons aluminum profile. Wherever in Europe, North America, South America in the Middle East or in Africa or south-east Asia have our customers. The product has won great favors from vast customers with its excellent quality. 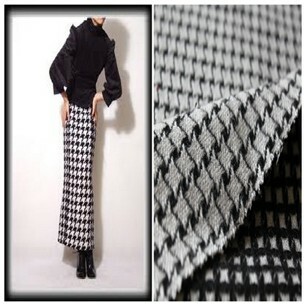 If you need houndstooth check fabric, please contact now.